For any entrepreneur or a startup or an SME, one of the most daunting tasks is to find decent office space, at a reasonable rate. Awfis, a startup that provides co-working real estate aims to address just that. Inspired by the shared economy ecosystem that is driving consumption of services such as cabs and hotels, Awfis has built its working model by leveraging underutilised assets through just in time offerings in the field of real estate. In conversation with CEO Amit Ramani, he shares some more details on the concept and how they aim to build on it further. What is the story behind settling down with offering co-working space solutions? Commercial real estate in India continues to operate in a very conservative fashion. In essence, Tier I commercial Real Estate has 17 percent vacancy across India and if one factors in Tier II commercial real estate, the vacancy numbers are in astounding millions of square feet. But the work spaces offered by real estate developers and conventional business centres command long-term commitments and huge deposit fees. This leads to SMEs, startups, entrepreneurs/solopreneurs being left with no option but to settle for sub-standard offices at inaccessible locations. This is an area where the Awfis value proposition comes into play, by offering affordable new age shared work infrastructure in prime locations across key metros. We provide users with the smallest denomination of office inventory, in most flexible and ‘just in time’ manner – 1 hour to 11 months. We offer cost effective spaces that provide a young and energetic environment, with a wide range of activity based settings. We also provide monetisation solutions to space owners for their underutilised inventory. Our business model enables us to effectively map demand with supply. Due to a rise in the entrepreneurial and mobile working population in India, the demand is gradually shifting towards smaller work space, while existing commercial realty offerings are in larger floor plate formats. There is a large proportion of customer footfalls across coffee shops, and hotel lobbies for business and professional meetings. In relation, employed and freelance professionals and groups spend a huge amount of time at non conducive environments. On the other side occupancy of meeting rooms and business centres of Hotels (3 Star to 5 Star) is abysmally low. The booking process of meeting rooms at hotels is a manual and time consuming process, lacking price transparency. Users can book the meeting rooms at Awfis centres or third party hotels in a matter of seconds. The listing of hotel meeting rooms is also ushering in price transparency in the category. How big is your team? How do you sustain this business model? We currently have a team of around 65 members which we plan to ramp up to 100 members in next 2-3 months. Our revenue model is through booking revenues from users for using private cabins, fixed desks, flexi-seats, conference rooms and meeting rooms on ‘Just in Time’ basis. We also earn revenue through F&B services and events being organised at some of our centres. Additionally, Awfis generates revenue share from bookings of meeting rooms of third party spaces and for ‘space as a service’, we earn revenue referral from partners. Are there any specific areas of technology that you keenly invest in? How are you making your services easy to use for the consumer? Our mobile app and website provides the ability to find, review and book work desks and meeting rooms on a flexible ‘just in time’ basis. Our mobile app is equipped with smart algorithms that enable a seamless customer experience. It also provides us with the ability to capture community member data (age, demographics, timings etc) providing valuable data analytics. The app ensures guarantee of ‘instant work space’ and 20 percent of the spaces are reserved for walk-ins. We also provide a separate platform to our partners for listing, and to monitor their work space bookings. Our centres are equipped with facilities such as NFC access and wireless services thereby enhancing a tech enabled user experience. We also focus on smart data analytics by capturing data through Access Cards (attendance), videography, RFID sensors on seats, browsing data, etc. Could you share details about the funding raised till now? What do you foresee in terms of funding for the future? Awfis has received a funding of $10 million from me and Radha Kapoor (Creative Entrepreneur and Founder – Indian School of Design and Innovation). Out of this $4 million has already been utilised. We plan to raise $40 to $50 million from PE/VC Funds in later part of current year. What are your growth plans and roadmap for the near future? How do you plan to widen your reach? Awfis has already set up 1,500 seats across 7 centres and we plan to add 3,000 seats by May 2016 across 15 centres in Mumbai, Delhi and Bengaluru. We are targeting 10,000 seats by end of this year and 25,000 seats by end of the next. We plan to add 1,000 meeting rooms listed on our platform by Dec 2016. Over the next 2 years the plan is to have an Awfis centre at every 10 minute driving distance across 7 cities (Mumbai, Delhi, Bengaluru, Pune, Ahmedabad, Kolkatta, Hyderabad). We are positioning Awfis as ‘the new age office’. We also plan to create a strong data analytics system where Awfis generate insightful research on office goers, which can be useful for member companies. This can later be synergized with larger companies providing products and services to offices — furniture or technology providers, for instance. What would you define as your USP? Awfis is India’s first and only technology platform that allows commercial real estate to be utilised in a completely flexible manner, both in terms of turn-around time and inventory. We are the only firm in India that aggregates bookings of hotel meeting rooms. As compared to conventional business centres and smaller co-working spaces, our membership plans are highly flexible and cost effective. 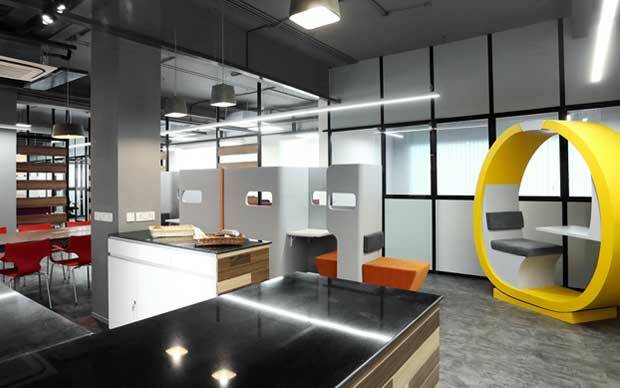 Our centres demonstrate a young and energetic design language with more activity based settings. The activity based settings go a long way in enhancing professional productivity. We adopt an innovative business model compared to other companies which add spaces by following straight lease models or revenue share model (with Minimum Guarantee). Apart from traditional rental models, we are also working on Asset Light Models and following Managed Aggregation approach for adding supply. As against peer to peer aggregation (like AirBNB), we manage user experience in these spaces ourselves as the operations are managed by us. We have curated partnerships with Tier-I service providers in domains that are essential for office goers i.e. accounting, legal, insurance, web computing, financial services, food and beverage etc. These strategic partners offer products and services to Awfis community members on a preferential and discounted basis (bulk pricing for large community). This is a strong value-add for members. Our partners also get access to the SME and startup community.